• Not a sealant – a Life Saver for very expensive and short-lived big wheels and tyres! 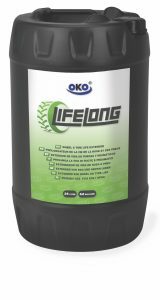 OKO LifeLong is a major step forward in heavy-duty wheel and tyre protection. It does more for both than any previous generation of product. Their shortcomings often include the lack of protection for static rims from the moisture-heavy air inside the tyre; the inability to protect alloys; either no anti-freeze to cool the tyres or harmful types of product being used; no clear indication of leaks; and the depletion of product that can lead to instructions to top up by 20% after a time. LifeLong overcomes all of those issues and is the natural choice for operators. It will not clog valves or TPMS, and it is biodegradable. The carboxylate technology of the liquid even succeeds in cleaning away pre-existing rust so rims can look better after use than before! Nitrogen fill can be used after fitting LifeLong, but actually why would you bother with the extra expense when this product generates such a massive improvement in tyre life? OKO LifeLong is primarily designed for use off the highway, and only in tubeless tyres. It can also be used on road for heavy trucks and service vehicles, having observed OKO’s recommended dosage quantities. The black 25 litre (6.6 gallon) drum can be used in combination with a durable all-alloy pump (sold separately), which delivers up to 250ml per downward stroke for rapid and accurate filling through the valve stem. Our specially-designed pump works against pressure, so you can inject liquid into tyres containing up to 60 psi/ 4.1 BAR. However, the quickest method is to pour LifeLong into the open tyre well from the drum, or having decanted into a measured jug, after mounting the first bead. Also available in 220 litre (58 gallon) drums and 1000 litre (264 gallon) IBCs. Vulcanising: First flush out with water, then dry tyre with “BUFSOL” solution. Colour: Green. Free-flowing. Low Odour.